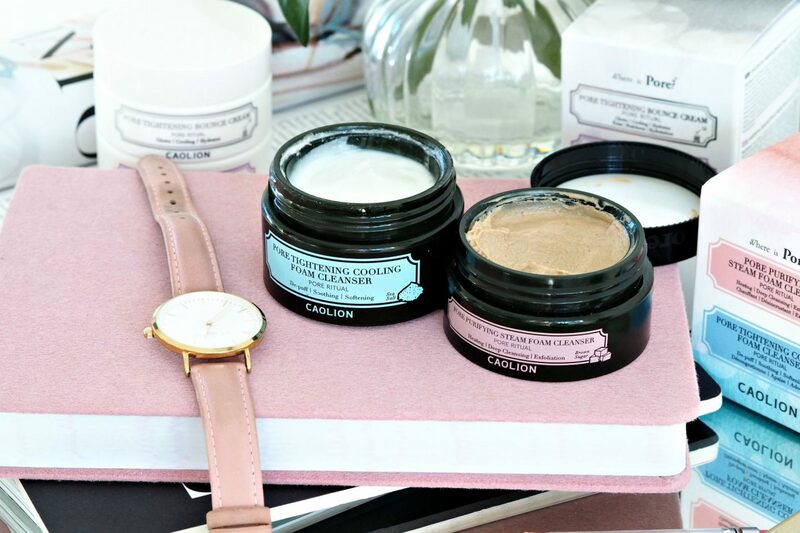 Is Caolion The Answer To Large Pores? I would probably say that out of all my skin complaints huge pores are my biggest bug bear. 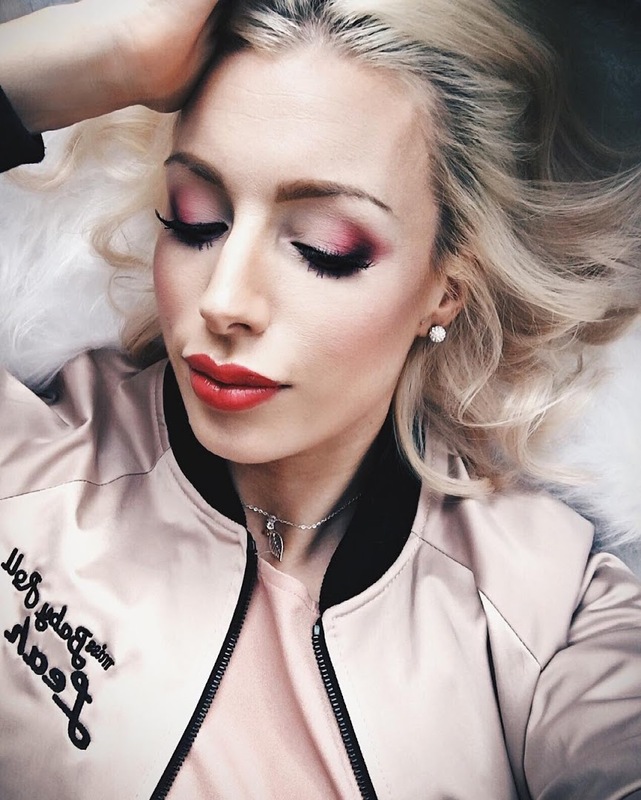 They don’t look too hideous without makeup but as soon as I wear makeup my skin looks like its had loads of pin pricks made to it and I’m really self conscious about them – as they are super big and cover my face! A few months ago I asked the wonderful people on Twitter what they would recommend for large pores and lot of them came back with the answer of Caolion…. The answer to my prayers I thought!….. But was it really? 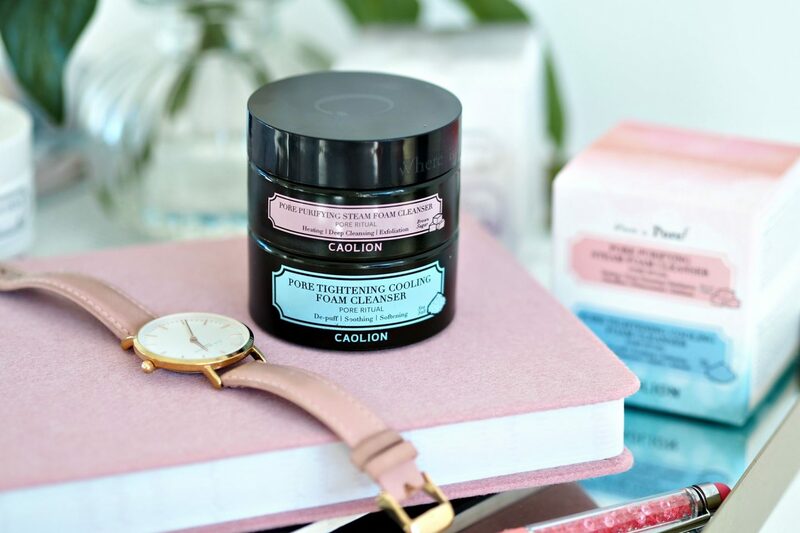 Here are my thoughts on the Caolion Hot & Cold Pore Pack Duo and the Caolion Pore Tightening Day & Night Glow Duo. The Caolion Hot & Cold Pore Pack Duo consists of a two step cleansing system. The first step is to use the “hot” treatment which is the Pore Purifying Steam Foam Cleanser. It’s a sticky brown mud like consistency and I must say does not smell at all pleasant – which I would imagine is the mix of the clay and charcoal – but to be honest I don’t care what it smells like if it works! Once it foams up you can feel your skin start to get hot very quickly, this is so it can gently “steam” your skin to open pores and penetrate them and remove impurities, blackheads and dead skin cells. It contains sparkling water, kaolin and dense ingredients like clay, charcoal powder and oatmeal, but yet it’s still very easy to wash off with water or a cloth. The next step is the “cold” treatment which is the Pore Tightening Cooling Foam Cleanser. This cleaner features a blend of glacier clay, mineral-rich volcanic ash and charcoal which absorbs excess sebum and is meant to reduce the appearance of pores. It’s off white in colour, has more of a cream consistency to it and smells strongly of peppermint which I thought I was quite nice. It felt very cooling and refreshing to use and my skin felt squeaky clean. Although this is a two step system I didn’t find the first step was great at removing my makeup, so I always did a quick pre cleanse with an oil cleanser before going in with the Caolion Hot & Cold Pore Pack Duo. Don’t be put off by the small sizes of the tubs – a little goes a long way with both of the cleansers as they foam up very easily. After using the Caolion Hot & Cold Pore Pack Duo my skin felt incredibly clean, silky, refreshed and smooth due to the removal of dead skin cells. In fact seriously smooth. Little bonus that it does some exfoliation there for you too! However it sadly did nothing for my pores. I’ve used this cleansing duo every day for a month so I’ve given it a good go, but I cannot see any change in their appearance. However if you’re just after a deep cleanse then I think you’d love it. You can buy the Caolion Hot & Cold Pore Pack Duo here. Another duo pack from Caolion and this time its their Glow Duo. 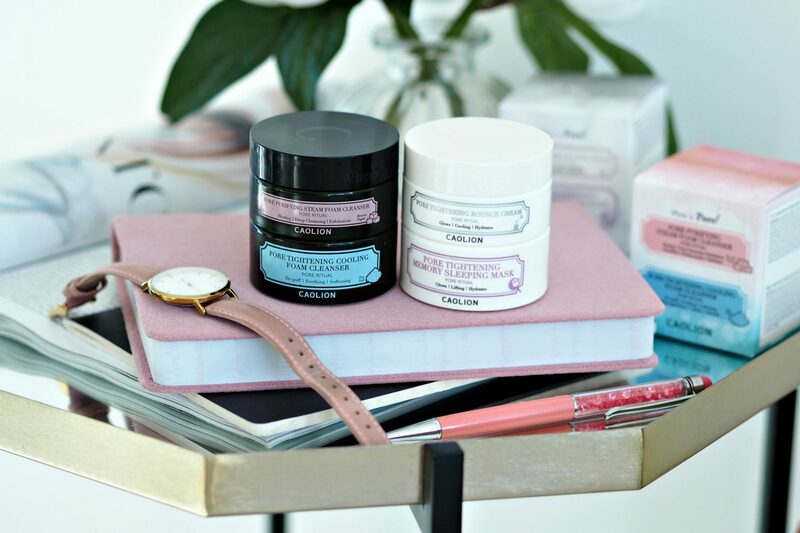 Let’s start with the Caolion Pore Tightening Bounce Cream which is to be used as a daily morning moisturiser. It’s a white, creamy gel cream and absorbs very quickly into the skin. It didn’t irritate my sensitive skin (in fact none of the products in this post did) and although it doesn’t feel like a luxurious thick cream my skin felt hydrated enough throughout the day. The Caolion Pore Tightening Memory Sleeping Mask is a pale yellowy colour and jelly like in consistency. I can see why it has the word “memory” in its name. Within seconds of prodding my fingers into this treatment and messing it all up, it closed back up to form a perfectly flat top that looked like it hadn’t been touched. I was really dubious about this mask but I must say that my skin has felt plumper while using it. 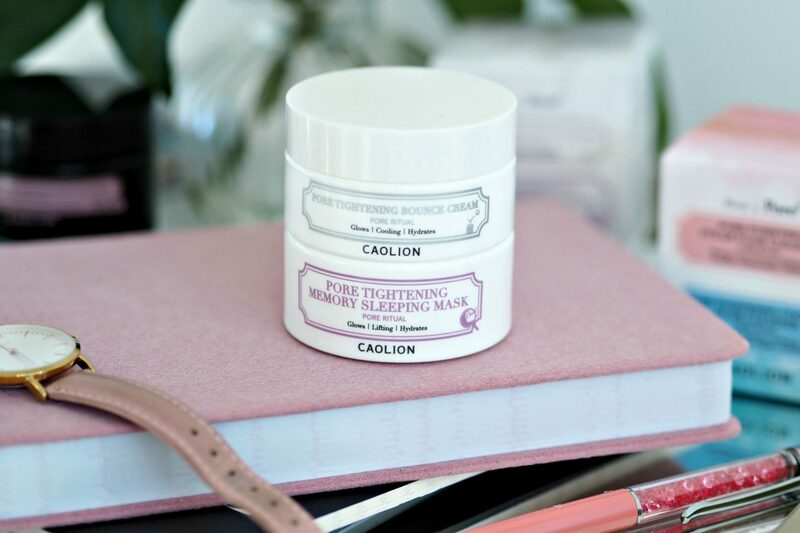 The Caolion Pore Tightening Memory Sleeping Mask contains niacinamide and oil-balancing natural extracts such as lavender, willow bark and rosemary so my skin was also a little less oily upon waking in the morning. Again though, unfortunately neither products have helped the size of my pores which was my main reason for trying them 🙁 If you have oily skin but don’t suffer with large pores then I think this would be up your street. You can buy the Caolion Pore Tightening Day & Night Glow Duo here. Are there are skincare products that you can suggest for large pores?